Shirring is a great sewing technique where you sew using elastic thread in the bobbin and the result is kind of a smocked look but that is stretchy. It looks complicated but it is actually really easy to do. First wind your bobbin with elastic thread. You’ll find the thread in a package usually on the notions wall. You want to stretch the thread slightly as you hand wind it (most machines won’t be able to spin it properly). You want to start with about double the width of fabric then you will need. Then just set your tension really high and your stitch length really long. All you have to do is sew make sure to do extra back stitching to secure the sewing. I use the presser foot as a guide to keep my rows straight but if you want the lines more spread apart you may want to use a disappearing marker and mark your sewing lines before you begin because once things become bunchy it’s pretty hard to just eyeball it straight. 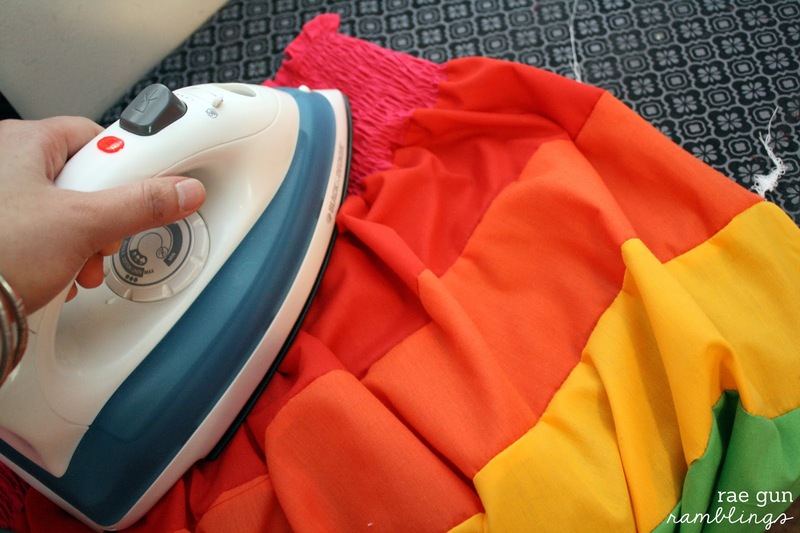 Use an iron to steam the shirred area. Don’t hold the iron directly on the elastic (I’ve melted it before). Instead tap it over the fabric side. This will make the fabric shrink up (which is the goal). And be sure to stop buy tomorrow to see the reveal of what I made. Hint T my 5 year old niece designed it :) If you sew you should definitely give it a try. The possibilities are endless and SO much cheaper than the pre-made stuff. Great tutorial, pinning it! I’ve tried shirring before but the elastic kept snapping, booo. Next time I do it, I’m referencing your tute! I’d definitely play with how tight you wind the elastic and the tension. Mind did fine on the highest tension but I think on my old machine it was better not to be maxed out. And you definitely don’t want the bobbin to be wound too tight. Hope it works for you! Shirring has never gone very well for me… I love the look of it though! I really need to try this! Thanks for the tutorial! Does it work with cotton as well as knit? I only tried once and didn’t know to iron it so it didn’t work. Wonderful tutorial! Thank you so much for sharing it with us! This is a great tutorial!! Looks like it’s going to be fun. Thanks for linking up at Romance on a dime!! so… I’ve had elastic thread forever!! I need to try it!! Pinning to hopefully try! I get how you through thread the Bobbin but how do you install the Bobbin in the bobbin casing/machine? Do you still thread it through the little slot like you would ordinary thread? Would love to try this! So cool! I love shirred/smocked material, but who can afford $27 a yd???? Now, I can do it myself!! Thanks so much for telling me how! Shirring always intimidates me. That’s one of sewing skills that I have yet to tackle. Thanks for sharing your easy tutorial with us at Merry Monday this week! just try it on fabric you don’t care too much about you’ll probably become hooked!